There are several factors that should be considered when renting a roll off container in Scott County, Iowa. We realize that many of our customers are first-time waste bin renters and may need some help or assistance with their waste management questions. We're here to help with any concerns you might have about roll off containers, waste types, banned materials, recycling, landfills, garbage collection, residential waste removal, dumpster sizes, etc. There are several waste management services companies in Scott County, but not all of them rent dumpsters. Our specialty is the delivery of roll offs to residents, business owners, and contractors in eastern Iowa. We focus on this service and are able to provide quality waste management and collection because we're not distracted or preoccupied with other activities. When you have the need for professional junk removal services, don’t contact an out-of-town firm-Go local and save yourself some time and frustration. Some of the 1 800 junk removal companies in Davenport, Iowa want to arrive at your home prior to giving you any indication about their prices. This can lead to an embarrassing experience if their prices exceed your projections. Our service is based on the volume, type, location, weight of your waste. We can’t always give you an exact price over the phone, but if you accurately describe the waste materials, where they’re located, etc, we can give you a pretty good idea of what it will cost to load and remove your junk. Contacting a local dumpster company in the Quad Cities area is as easy as picking up a phone and dialing (563) 424-6066. We have a local number and a local office. While some companies have you fill out forms on their internet web page or call an out-of-state customer service center, you can contact us direct. Before you call us for your Bettendorf, Ia job, you might want to read the next section to get some ideas about ordering a dumpster in the Quad City, Ia area if you haven’t ordered one before. Containers come in all different shapes and sizes in Panorama Park, Ia, so you’ll need to decide which size best suites your needs. Typical waste management equipment sizes include 10, 20, and 30 cubic yard. And for those customers with just a few items to be tossed out, we recommend our junk removal service. Junk removal service is ideal for residential bathroom remodels, spring clean ups, or junk removal projects in Davenport, Iowa. This service fits in with most anyones budget and is most helpful when you don’t feel like, or are unable to, fill your own garbage bin. 10 yards are typically rented out in Dixon, Iowa for roofing tear offs up to 20 squares, junk removal projects, and concrete recycling. 20 yard roll offs are a favorite of Donahue, Iowa contractors, home builders and homeowners. The 20 yard roll off dumpster can also be used for asphalt shingle tear-offs up to 40 squares. When you have a really big disposal task in Maysville, Ia, our 30 cubic yard size might be what you need. This container stands six feet tall and can be rented for commercial contractors and residents needing to rid their lives in Davenport, Iowa of large quantities of debris in New Liberty, Iowa. You might want to have a dumpster available for your Davenport, Iowa project prior to starting to avoid the double handling of waste materials. Alternatively, if you’re going to generate a small quantity of construction debris over a long period of time, you might want to wait until you have accumulated some debris before taking delivery of your container. This will enable you to minimize your container rental fees on your project. Dumpsters are large metal objects that take up a lot of space, so you’ll need to decide where you want your rented equipment to be placed once it arrives at your Blue Grass, Ia location. These large waste management bins can be 24 feet in length, and 8 feet in width and are delivered by roll off trucks that are about 36 feet in length. You’ll need to pick a truck accessible location that is hard, level, and free of overhead obstructions. Parking areas, sturdy driveways, and even city streets(where local ordinances allow) are all possible dumpster locations. Experienced dumpster delivery drivers can also help choose a location once they arrive at your Eldridge, Ia location. Hazardous materials, flammables, oil, gasoline, coolants, liquids, paints, pesticides, electronic waste, tires, yard waste, appliances, etc are just some of the items that can NOT be discarded in a landfill or waste management container. State and Federal regulations prohibit the landfilling of many materials, so if you are in question about a particular item or waste, please ask us before disposing of it in your Buffalo, Iowa dumpster or Buffalo, Iowa landfill. Overloading your rented container by weight or volume, can cause accidents, injuries, and will result in additional charges. Don’t fill your dumpster over the sides or dispose of more that 8 tons of debris in any dumpster. When loading dirt, concrete, shingles, cinder block, please do not place more that 10 cubic yards of material in a single load. How muck does junk pick up cost in Davenport, Iowa? Well junk pick up in Davenport, Iowa isn’t free, but if you’ve got junk don’t call a 1800 out of town number- Call a local junk pick up business and save money on your furniture removal, hot tub removal, appliance pick up, garbage disposal, etc. We recycle as much waste a practicable and dispose of the rest in an environmentally responsible way. We’re professional and our crew is courteous and experienced. When it comes to waste management in the Quad Cities area, we’re the professionals. Large quantities of clean concrete can be recycled from your Le Claire, Iowa job site if the material is 100% concrete and is not contaminated with any other materials. If you are removing a concrete driveway or sidewalk from your Maysville, Iowa property, contact us about our dumpster recycling service. Think twice about using a fly-by-night dumpster service. Sometimes it’s better to use a quality waste management and waste collection company for your dumpster and waste removal needs in Clinton. Call us at (563) 424-6066 or search your phone book or internet for the numerous waste collection companies who serve the garbage collection needs of Iowa. There are a number of companies on the internet that pretend to be a waste and dumpster rental company. They are mostly out-of-state waste brokers who don’t own a single truck or waste container. They will take your order, contact a sub-contractor to deliver a dumpster, and over charge you for their service. Problem is, they are expensive and don’t have control over when you get your dumpster delivered or removed. So cut out the unnecessary middle-men and contact us direct for your Riverdale, Ia waste management needs. We accept Visa or Master Card for our garbage dumpster service anywhere in the Quad City area . Scott County residents, business, contractors do not need to have an account with us to rent a dumpster, just have a credit card available when ordering your roll off container. Contractors need prompt reliable service in order to complete their Buffalo, Iowa building on time. We understand this and provide reliable service for New Liberty and all of Scott County, Iowa. Removing a concrete driveway or sidewalk at your home or Davenport, Iowa business? If so, we can save you money if you’re willing to keep you concrete clean from other debris. Call us for details! We use a variety of DNR and EPA approved landfills in Clinton County, Rock Island County, and Scott county. We prefer to recycle waste rather than fill up this Scott County landfill. We have all seen advertisements for green dumpster bags on television suggesting that a dumpster bag is ideal for the disposal of unwanted debris. Well our full service junk removal service can remove your unwanted debris without renting a dumpster or purchasing a dumpster bag. So consider doing your next cleaning project while incorporating our handy junk removal service and you’ll be glad you did. 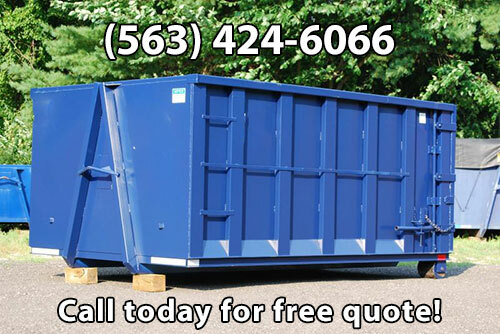 Call us at (563) 424-6066 and leave the waste loading to us. We’re a Quad City, Ia garbage collection, garbage disposal, garbage removal company. In Bettendorf we’ve rented dumpsters off of Devils Glenn Road, State Street, Crow Creek Road. In Davenport, Iowa we’ve removed junk off of Kimberly Road, Telegraph Road, Brady Street. Collected waste from residents near Hickory Grove Road, Harrison Street, Northwest Blvd, North Marquette Street. Recycled concrete from locations near Waverly Road, Rockingham Road, and W Locust Street. Our waste collection services in Eldridge, Iowa have included delivering roll off containers to locations near West Price Street, Pinehurst Drive, West Davies street and South Buttermilk Road. We’ve provided junk removal service from residents in Walcott, Iowa near the world’s largest truck stop, North Downey Street, East Bryant Street and Otis Street. Our mini small dumpster rental service in the Quad Cities area has served customers around Jones Street Le Claire Iowa , Vernon Street Eldridge, Iowa and Greenbriar Drive Bettendorf.